Astronomy Science ~ Scientists have discovered something truly remarkable in the Earth's atmosphere. An "invisible shield" which lies about 7,200 kilometers above. 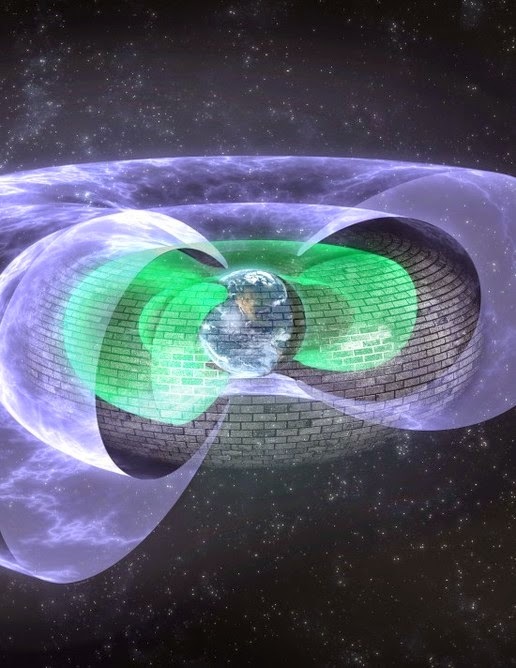 This shield is found in the Van Allen radiation belts, two donut-shaped ring on earth filled with high-energy electrons and protons held in place by Earth's magnetic field. Van Allen radiation belts swell and shrink in response to disruption of energy coming from the sun. In the late 19th and early 20th century, some scientists Carl Stormer, Kristian Birkeland, and Nicholas Christofilos speculate about the possible presence of a belt of charged particles around Earth. However this remains a speculation until succeeded in confirming these findings in 1958. However, scientists have only found two belts, belts inside and outside stretching up to 25,000 kilometers above the Earth's surface. However, last year, Professor Daniel Baker of the University of Colorado Boulder and his colleagues used the Van Allen twin spacecraft, launched in 2012 to find the third missing ring. "According to their research, the third belt is located between the inner belt and the outer belt. This belt is different, he appeared and disappeared when space weather changes. Today, Baker announced that his team has discovered the boundary between the outer and inner belt. This boundary layer itself looks like a protective shield in Star Trek and serves to block the killer electrons move deeper into the Earth's atmosphere. Electrons which came during intense solar storms can be very devastating and drove at speeds of light, they are threatening the safety of astronauts in orbit, the satellite can bake and damage the equipment space. Earth's magnetic field hold the belt in place, but scientists say that the electrons in the belt - which drove at speeds nearing the speed of light - is being blocked by some invisible force. However, in the case of Earth, invisible shield is being used to stop the killer electrons that enter the atmosphere. Now scientists know there was invisible shield and they try to determine how it was formed and how it works. "It looks like the electrons toward the glass wall in space. This is a very confusing phenomenon."